Take 1 packet daily or as directed by a health care professional. For best results, take with 8 ounces of juice or other high carbohydrate beverage 1 hour before or immediately after training. 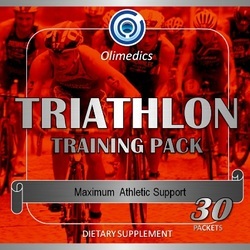 This product is intended for use either before or after workouts for a period of approximately 4-6 weeks. After all packets are taken, this product should be discontinued for 2-4 weeks before starting the next cycle. CONTAINS SOY (LECITHIN / ISOFLAVONES), MILK (COLOSTRUM), AND WHEAT (OCTACOSANOL). This product is manufactured and packaged in a facility which may also process milk, soy, wheat, peanuts, tree nuts, fish and crustacean shellfish. WARNING: This product contains 100mg of caffeine per serving (equivalent to 1 cup of coffee). KEEP OUT OF THE REACH OF CHILDREN. DO NOT USE IF SAFETY SEAL IS DAMAGED OR MISSING. STORE IN A COOL, DRY PLACE. WARNING: Anabolic activity of this formulation has led to restriction of use by some athletic organizations. Professional athletes should consult their trainer before using this product. Active ingredients: Vitamin B-6 (pyridoxine hydrochloride), Vitamin E (dl-Alpha tocopheryl acetate), Magnesium (oxide), Zinc (oxide / methionine / amino acid chelate ), Copper (gluconate), Chromium (picolinate), DHEA (Dehydroepiandrosterone), 5-Methyl-7-Methoxy-Isoflavone, Rhodiola Rosea (5% rosavin), Tribulus Terrestris (22% extract / 45% extract), Tongkat Ali Root (powder), Deer Antler (powder), Creatine Monohydrate Powder, Creatine HCl, Creatine Pyruvate, Alpha Lipoic Acid, Guarana 33% extract (providing 100mg naturally-occurring caffeine), Theobromine (from Cocoa powder), L-Arginine (L-arginine base), L-Ornithine (L-ornithine hcl), L-Lysine, L-Glutamine, L-Glutamic Acid, L-Alanine, L-Glycine, Colostrum (bovine)(7% IgG / powder), OKG (L-ornithine alphaketoglutarate), Saw Palmetto, Pygeum Africanum, Pumpkin Seed, Octacosanol (from wheat germ), Konjac Root, Eleutherococcus senticosus, Ginger Root (powder), Garcinia Cambogia (50% HCA), Spirulina, Gotu Kola, Lecithin, Damiana, Burdock Root, Cayenne Pepper, Goldenseal, Gravel Root, Marshmallow Root, Parsley Leaf, and Juniper Berries.